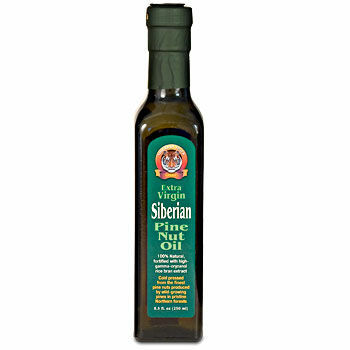 For many centuries native Siberians have successfully used pine nut oil to control hunger, aid digestion, and boost stamina. Extra virgin pine nut oil (EVPO) is a delicious, golden-colored oil cold-pressed from the small kernels (commonly called pine nuts), which are produced by certain species of pine trees around the world. In addition to being an exquisite gourmet cooking oil, it also has a history of many centuries of therapeutic use in Russian and Chinese traditional medicine. The native people of Siberia – a remote region of Russia famous for its pristine forests, crystal-clear rivers and lakes, as well as remarkably vibrant health of its inhabitants - have always used pine nut oil as an effective, all-natural hunger suppressant, metabolism enhancer, digestive aid and peptic ulcer healer. In view of the recent obesity epidemic in much of the industrialized world, pine nut oil became a subject of close scrutiny by nutritionists and researchers as a natural way to promote satiety and curb overeating. have provided a long-lasting feeling of “fullness”. In addition, pine nuts and their oil provided the natives with a rich array of essential vitamins, nutrients, and microelements such as vitamins E, B1, B2 and B3, beta-carotene (pro-vitamin A) and other carotenoids, essential amino acids, magnesium, zinc, iron, copper, and iodine. This allowed the Siberians to have a full complement of nutrients required to go about their daily routines, which usually involved hunting, fishing, and trapping, without feeling hungry. These powerful health-promoting and nutritional benefits have earned the Siberian pine (the tree from which pine nuts were harvested) the name of “the Tsar of all trees” in Russia. 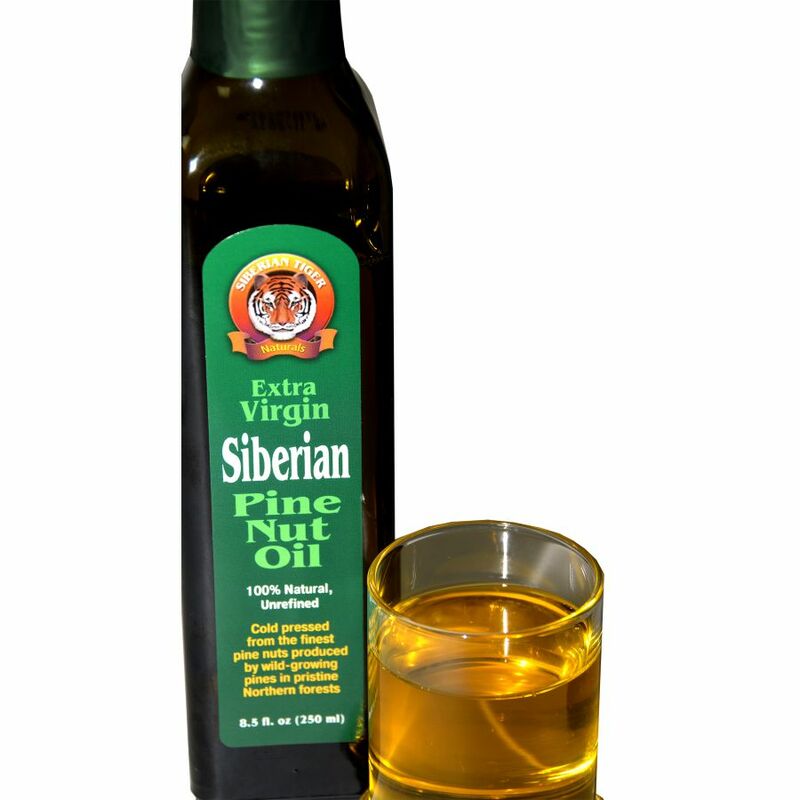 These traditional uses of extra virgin Siberian pine nut oil drew a lot of attention from Russian and Chinese scientists and researchers who conducted numerous studies to figure out the biochemical processes behind the satiating and health-promoting action of this oil. They have studied various components of pine nut oil to figure out what unique ingredients in it may be responsible for these health effects. Finally, they zeroed in on two important components of pine nut oil: antioxidants and pinolenic acid. Pinolenic acid (a triple-unsaturated fatty acid which is a positional isomer of a more widely known gamma-linolenic acid [GLA]) is found exclusively in pine nut oil, and is not present in any other species of plants. This fatty acid is present in all 140 varieties of pine nuts (and their oil) in quantities ranging from 0.1 to more than 20 percent. However, the richest known source of pinolenic acid is the oil pressed from the seeds of the Siberian pine (Pinus Sibirica). 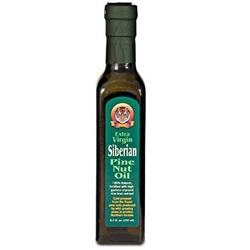 It was this oil, containing up to 27 per cent of pinolenic acid, that the native Siberians used as a nutrient-rich food and a healing remedy. This research into the health-promoting and healing properties of extra virgin pine nut oil took a new direction with the discovery of a substance called cholecystokinin (CCK). This protein, produced in the small intestine and also present in the brain, was first identified 27 years ago by scientists at Columbia and Cornell Universities. They have discovered that CCK is produced in the duodenum after eating and sends a “full” feeling to the brain, calling it a 'satiety protein". At the same time, CCK slows the rate of stomach emptying, providing an additional feeling of fullness. Scientists have also demonstrated that pinolenic acid favorably affects total blood lipids, reduces platelet aggregation, and lowers blood pressure, contributing to cardiovascular health. In addition to transmitting vital satiety-related messages to the brain, CCK performs another very important and useful physiological function. It is, in fact, a critical catalyst for the proper digestion of food in the intestinal tract. CCK does this by triggering the release of digestive enzymes from the pancreas. In addition, it causes contraction of the gall bladder to deliver bile into the duodenum, and stimulates secretion of bile salts into the biliary system. In fact, its very name, cholecystokinin, means “to move the gall bladder”. By ensuring the availability of bile salts and enzymes to properly break down large macromolecules (proteins, polysaccharides, and triglycerides) into small molecules (amino acids, monosaccharides, and fatty acids) used by our bodies as all-important “building blocks”, CCK further enhances the overall performance of our metabolic system. This puts an end to nutrient deficiencies, which often are the underlying reason for food cravings. As a result, our body assimilates more vital nutrients, needs less food to satisfy its basic nutrient needs, and a lasting feeling of satiety is effectively achieved. If your goal is to optimize your food intake, improve digestion and provide your body with important healing and health-promoting nutrients, we recommended taking 15 ml (three teaspoons, or one tablespoon) of extra virgin pine nut oil daily. The best way of taking the oil depends on your individual preferences. For example, you may take one teaspoon of pine nut oil with a full glass of water or fresh-squeezed juice three times daily 30 minutes before breakfast, lunch, and dinner. The oil may also be taken twice a day: half at breakfast, and the other half at lunch or dinner. To use the oil as a mild laxative, take a full tablespoon (15 ml) of the oil on an empty stomach in the morning or at bedtime. Experimentation and practical experience will be your best guides in working out a daily pine nut oil regimen that would be most effective for you and your individual weight and health goals. And it is also nice to know that, while working to achieve your optimum weight, enhance your metabolism, and achieve wellness, you will also be boosting your antioxidant status and protecting your stomach lining from inflammation-related disorders. Another great thing about extra virgin pine nut oil is that, in addition to taking it straight by the teaspoon, you can use it in a variety of delicious and healthy recipes ranging from salad dressings and pastas to pesto and homemade nut butters. Extra virgin pine nut oil is a gourmet culinary oil that can be used in your kitchen in a variety of creative ways. For example, you could use in baking and light sauteing, or as an absolutely delightful dipping oil. If desired, it can be mixed into olive oil or used instead of it on your salad or in any of your favorite dishes that call for vegetable oil. We have a special page on our site devoted to our very own favorite pine nut oil recipes. And, most importantly, pine nut oil makes every meal you cook more satisfying and nutritious. In addition to being a potent satiety promoter and digestive aid, extra virgin pine nut oil is also successfully used in naturopathic medicine to treat peptic ulcers, gastritis, and other gastrointestinal problems, cardiovascular, inflammatory, and autoimmune disorders. Pine nut oil also offers powerful antioxidant protection to those exposed to increased oxidative stress (a group that includes pretty much everybody living in industrialized countries in the 21st century). Update: This product is not certified Organic by the FDA due to the cultivation and harvesting being outside the US but this product is ORGANIC and RAW! The powerful healing and health-promoting properties of extra virgin pine nut oil have been known in Russia and Europe for a long time. Ever since the 16th century Russia has been exporting Siberian pine nut oil to Sweden, England, and other European countries. Dr. Peter Pallas, a member of the Russian Academy of Sciences, has written the following about pine nut oil in 1894: "In Switzerland, they use our pine nut oil in pharmacies. The oil is prescribed to people suffering from gastric ulcers. It is also used to treat respiratory disorders, as well as burns and other skin problems."